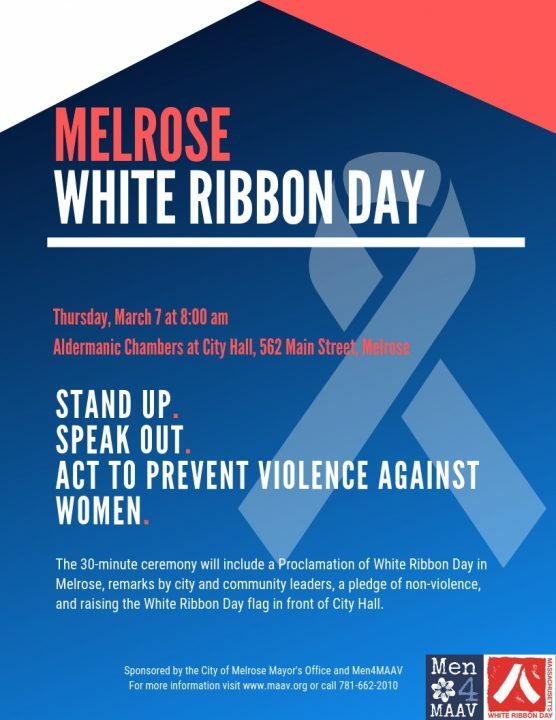 All are welcome to join us for Melrose’s 2nd Annual White Ribbon Day event! It’s being held on Thursday, March 7 at 8:00 am in the Aldermanic Chambers at City Hall. This event calls upon men to stand up and be counted as allies against violence towards women. The White Ribbon Campaign was created by a group of Canadian men in 1991 on the second anniversary one man’s massacre of 14 women in Montreal. Today it’s a worldwide campaign in over 60 countries. The Massachusetts White Ribbon Day Campaign is sponsored by Jane Doe Inc., the Massachusetts Coalition Against Sexual Assault and Domestic Violence. 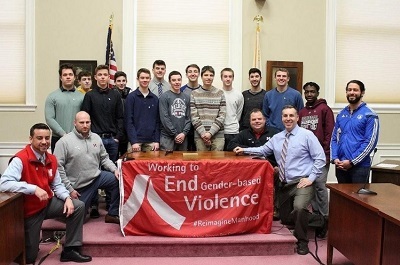 The brief, 30-minute ceremony on March 7 will include a Proclamation of White Ribbon Day in Melrose, young men leading a pledge of nonviolence, and raising a White Ribbon Day flag to raise awareness. The event is sponsored by the City of Melrose Mayor’s Office and Men4MAAV, an initiative launched by the Safe Steps for Melrose project, a partnership between the Melrose Alliance Against Violence, Melrose Public Schools, Melrose Police Department and other community agencies. While the purpose of the event is to bring men together, women are more than welcome to attend.